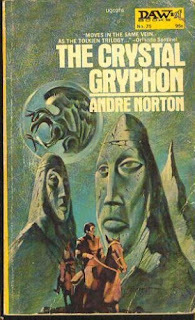 I remember the day I first discovered science fiction grand dame Andre Norton. I walked into our favorite used bookstore in San Antonio, Texas. The same used bookstore where I first ran across so many other gems. This particular trip I was looking for something unusual and different and my eye caught on the cover on the left above. I liked how angular the art was and the look of the two companions traveling through what appeared to be an extremely bleak, almost sinister landscape. So I picked up The Crystal Gryphon and took it home with me. 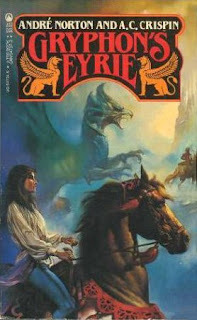 I was intrigued by the title as I had absolutely no idea what a gryphon was or if a crystal one was exceptional in any way. Shortly after returning home I blew back into the shop, hoping against hope they would have the two sequels it listed inside the cover. Lucky for me, they did. And they had learned by then not to be surprised by the neighborhood kid's urgent comings and goings. I'm pretty sure one of them was a Norton fan anyway. Kerovan has been cursed since birth. On her way home, his mother was forced to take shelter in one of the ancient ruins of the Old Ones and, as a result, Kerovan was born with hooves instead of feet and eyes the color of molten amber. The heir to the Ulmsdale estate in High Hallack, Kerovan's life has never been his own and he spent much of it being tutored in private and shunned in public by his father's people who do not trust the eldritch young lord. At the same time, far away in the Dales, the young lady Joisan has been married by proxy since she was eight years old to a mysterious Lord Kerovan whom she has never met. Expected to grow up and take over the reins of running his household, Joisan's path takes a drastically different turn when an unidentified force invades High Hallack from the sea. With nothing but a small gryphon set in a crystal globe sent from her lord to wear around her neck, Joisan takes up the armor and weapons to defend her homeland. Kerovan is forced to travel to find Joisan and the two strangers must join together to defeat the dark magic that is invading their land. In this case, I can tell you that the cover art on that first book is right on. I can't imagine a cover that would more effectively convey the marvelous blend of cold magic and unknown danger that fills this novel. I fell instantly under its spell and could not get enough of Kerovan and Joisan and the awkward way they had to get to know one another against a backdrop of war. They are both so tentative and independent and used to silence and walking hallways alone. The idea of the marriage by proxy fascinated me in a sort of morbid way. I felt so bad for Joisan, but bad for Kerovan as well as he was not used to people becoming accustomed to him and/or welcoming them to their homes. He cannot imagine Joisan would want him and, when she mistakes him for one of the Old Ones upon first meeting, he is sure of it. The story alternates between their points of view and by the time they actually meet for the first time the reader is filled with that delicious mouthful of more knowledge than the characters themselves have and a fierce urging to root for them. It was a pleasure watching them get to know one another and it was especially interesting as the world itself is such a well-developed major player in the novel. Things are by no means "resolved" by its end and I plowed through the next two with relish. A highly recommended trilogy, certainly for Norton fans, but also for those who enjoy their fantasy mixed with a hint of the weird and featuring a pair of strong main characters. 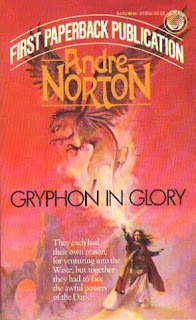 I've never read anything by Andre Norton. I think I'm going to have to remedy that someday. It's kind of like the books you mentioned, "fantasy mixed with a hint of weird" and heavily featuring a mythical/mysterious type of religion. Brenda, I definitely recommend her. You can probably start anywhere, but I have a soft spot for these three. Samantha, that's so interesting! I've never read anything else by Crispin. Sounds like I need to look her up. Thanks for the tip!